Can I use my vehicle with your pumps? Many times we are talking with potential customers and they ask if they can run our hydraulic submersible pumps off of their skid steer or backhoe. The answer is yes you can run our pumps off of your vehicle’s auxiliary hydraulic circuit as long as the hydraulic output (flow and pressure) meets or exceeds the requirement for the submersible pump. Most of our pumps operate at pressures up to 2500 PSI (170bar) which is common to many vehicle hydraulic power supplies. If your vehicle’s hydraulic system is capable of providing more oil flow than is required by our pumps, a flow control can be added to the circuit to prevent over-speeding. What if my vehicle’s auxiliary circuit is controlled by a directional valve? If your vehicle’s auxiliary circuit is controlled by a directional valve (spool valve with lever), it is allowable if they are Open Center (motor spool) valves. 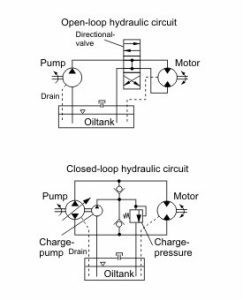 In an open center circuit, the valve controlling the direction of oil on the submersible pump is allowed to pass through the valve and return to the oil reservoir and allows the pump impeller to slowly wind down. 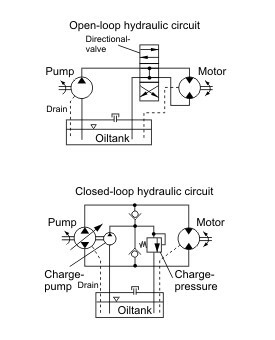 See this hydraulic diagram that shows a typical open center hydraulic circuit. If the valve has the capability to run the pump in reverse direction, a check valve must be fitted to the return line to prevent reverse rotation. We recommend running the return line directly back to tank (preferably through a return filter before entering the reservoir) to prevent the possibility of reverse operation and to alleviate the concern of whether your valve is open center or Closed Center (cylinder spool). If you are not sure if the equipment you currently have is a good match for our pumps, just give us a call 570-645-3779.